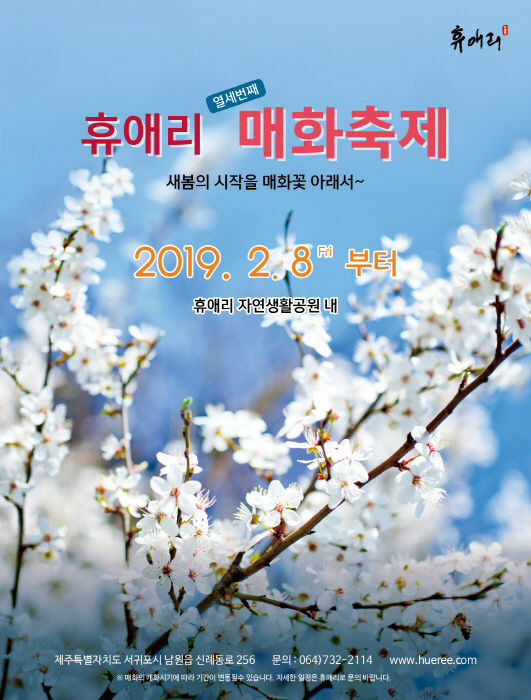 Held in Hyuae-ri at the foot of Hallasan Mountain in Jeju Island, Hyuaeri Maehwa Festival is held every spring full of the scent of apricot flowers. Visitors can enjoy the beautiful apricot flower fields at Hyuaeri Natural Park. - Sold products: Total of 15 booths selling Jeju local goods, handmade products, and more. From Jeju International Airport, take a local bus No. 500 to arrive at Ara Elementary School (아라초등학교) Bus Stop. Make bus transfer to red (intercity) bus No. 781 then get off at Harye-ri (하례리) Bus Stop. Walk for about 2 minutes to proceed to Harye-ri Ipgu (하례리입구) Bus Stop, and get off at Sinrye 1-ri (신례1리) Bus Stop. Finally walk for about 30 minutes to arrive at the entrance of Hueree Natural Park (휴애리 자연생활공원) gate.